It is my pleasure to announce in this and the following entries the publication of three new volumes of the Studies of the Max Planck Institute Luxembourg for International, European and Regulatory Procedural Law, starting with volume 8, edited by Professors B. Hess and X. Kramer. What road should procedural innovation take? Twenty years after the adoption of the extended competence in the area of judicial cooperation under the Amsterdam Treaty, numerous instruments on European civil procedure have been developed and enacted by the EU legislature, and applied by national courts. There is no doubt that these instruments have built a genuine Judicial Area where citizens and businesses can rely on operating justice systems and functioning cross-border cooperation. While it remains important to study these legislative instruments and, where necessary, to establish new instruments, civil procedure in the EU has entered a new era in which the development of common standards and best practices in the Member States and at the EU level are of the essence. The theme of the present book is inspired by the shift in focus from the establishment of new legislation with common rules to a focus on the actual implementation, application, and operationalization of the rules on cooperation in civil justice. While the discussion of common rules continues to be important and has regained importance as a result of the “common minimum standards” initiative of the European Parliament, some papers in this book also focus on how to move beyond common rules and towards best practices. 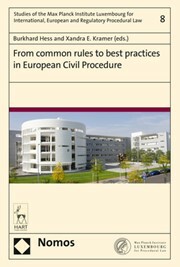 These “best practices” in applying European instruments, implementing new pathways to civil justice – including eJustice, alternative dispute resolution (ADR) and collective redress — and the operationalizing of judicial cooperation, for instance through the European Consumer Centres and the European Judicial Network, give body to the principles of mutual trust and judicial cooperation. These can in turn feed the further development of the European civil procedure framework from the bottom up. Part I is a general part dedicated to common standards of EU civil procedure, focusing on the harmonization of civil procedure and judicial cooperation in general. The central questions of this part concern whether there is a need for common standards of EU civil procedure, how to identify them, and whether we need harmonization to achieve harmonious cooperation. The chapters included in Part II of the book are organized around the question as to whether and how innovative mechanisms for dispute resolution can enhance cooperation in the field of civil justice. E-Justice has been one of the spearheads of the European Commission to improve access to justice, with the establishment of the e-justice portal as the main achievement. Part III is dedicated to alternative dispute resolution. Encouraging and improving Alternative Dispute Resolution (ADR) mechanisms, in particular for consumers, is another focal point in EU policy to simplify access to justice in recent years, and has resulted in the Directive on Consumer ADR48 and the Regulation on Consumer Online Dispute Resolution (ODR) along with the establishment of the ODR platform. Part IV includes a number of short chapters on best practices in the EU to operationalize judicial operation and to improve mutual trust. With contributions from more than 20 experts from practice and academia this remarkable conference volume offers valuable blueprints for a reinvigorated judicial cooperation.